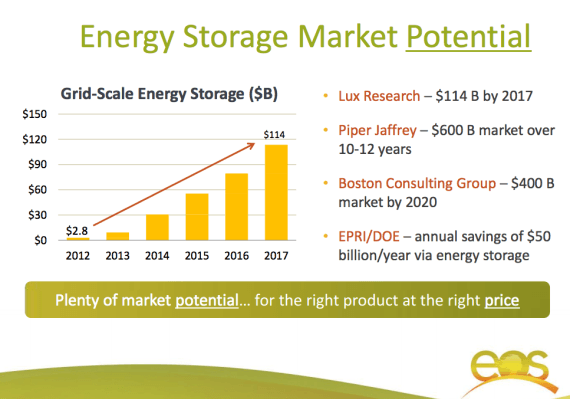 Fueled by power market reform and technological advances, investor enthusiasm regarding the commercial prospects of advanced energy storage technology is on the rise. A study by the Electric Power Research Institute and the U.S. Department of Energy determined annual savings of $50 billion could be realized by deploying energy storage systems across the U.S. power grid. Savings of this magnitude, along with market researchers predicting rapid growth in revenues, is stoking investors' appetite for pioneering young companies that have proven their advanced energy storage solutions commercially. Among this small but growing set is Millbrae, California-based Stem, whose technology is capable of managing fleets of distributed energy storage systems so as to meet or exceed grid operators' needs and yield attractive financial returns and environmental benefits. On Jan. 7 Stem announced it had closed a $27 million equity financing round. Constellation Technology Ventures and Total Energy Ventures joined earlier investors, including GE Ventures, that see energy storage playing a growing role in the U.S. power grid, both in front of and behind the meter, and Stem's technology helping drive that growth. Integrating energy storage systems distributed across multiple customer sites, Stem's predictive analytics software platform optimizes charging and discharging of battery storage capacity. This is a defining attribute that can enhance grid power reliability and resiliency -- and do so even more more efficiently than conventional fossil fuel-fired reserve generation capacity, proponents contend. Conducting their own research, power industry and market regulators in states such as California, Hawaii, New York and Texas have instituted market reforms that open the door for energy storage providers to gain a foothold in local and regional markets. Back in November, Stem was one of three pioneering power technology companies awarded contracts by Southern California Edison (SCE) to deploy advanced energy storage systems “behind the meter” at utility customer sites. SCE's solicitation to include distributed energy storage solutions as a means of meeting forecast local capacity requirements marked a milestone in U.S. power industry history.